The 10th Annual Lancaster Avenue Jazz & Arts Festival will be hosted by People’s Emergency Center (PEC) on Saturday, July 16th from noon to 7pm in Penn Presbyterian Saunders Park Greene, at 39th and Powelton Avenue. This year’s festival will showcase the female artists who have shaped jazz and are solidifying its future. Pianist and composer Sumi Tonooka will headline the event, which is free and open to the public. The free Lancaster Avenue Jazz & Arts Festival will offer activities for the whole family: a mix of exemplary musicians, a diverse gathering of people, a view of the city and a chance to enjoy a neighborhood that is rich in arts and culture. The event has grown over its 10 years from having a few hundred attendees to more than 3,000. Read the People’s Emergency Center’s press release for more information. 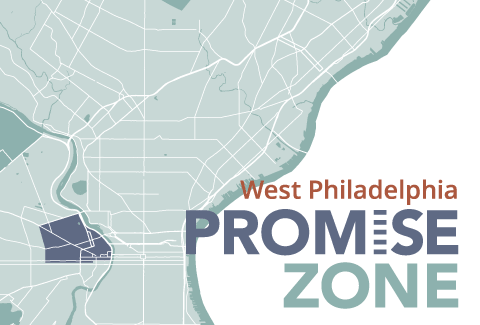 Over the last 6 months the Promise Zone Small & Emerging Business Working Group has piloted a lending and technical assistance (TA) program targeting business and property owners on Lancaster Avenue and 52nd Street. This has involved close collaboration with many partners, including Community Development Financial Institutions (which provides loans to small businesses), Commercial Corridor Managers, and the Philadelphia Department of Commerce. Promise Zone AmeriCorps and AmeriCorps VISTA open positions!